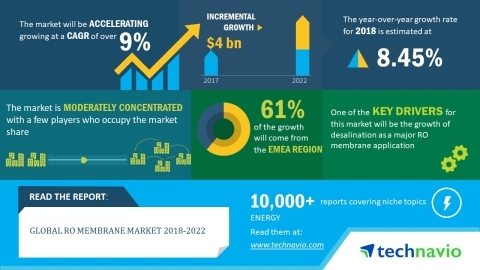 Technavio analysts forecast the global RO membrane market to grow at a CAGR of over 9% during the forecast period, according to their latest market research report. RO membranes with a high recovery rate is one of the major trends being witnessed in the global RO membrane market 2018-2022. In most RO systems, 70% - 90% of feed water is wasted, depending on the design and operating conditions. Most RO systems use similar kinds of membranes and distribute water through the element in the same manner, and thus, do not increase the water purification system's efficiency. Manufacturers of RO systems have attempted to increase the efficiency of their water purification systems by resorting to either an adjustment in the size of the reject flow controllers or modifications to the ancillary components of the RO system, such as storage tanks. But these methods have not provided the expected results, in terms of increasing the recovery rate. There is an increased need to identify new sources of water to bolster supply due to the rise in the global demand for freshwater. Desalination is one such method that is mainly used in arid and semi-arid regions across the world where other water supply options are limited. Desalination is increasingly becoming the common method of meeting the growing demand for water globally. Globally, during 2010-2018, the number of desalination plants increased by 46%. The global RO membrane market research report provides market segmentation by region (the Americas, EMEA, and APAC). It provides an in-depth analysis of the prominent factors influencing the market, including drivers, opportunities, trends, and industry-specific challenges. EMEA led the market in 2017 with a market share of nearly 60%. This region is expected to dominate the market through 2022. Jin Hui Plastics Industrial Co., Ltd.